Here at the Best Western York House Hotel, we gladly accept dogs in certain rooms. the charge for this is £10.00* per night per animal. All dogs will recieve a comfortable bed and bowl and warm welcome from us. 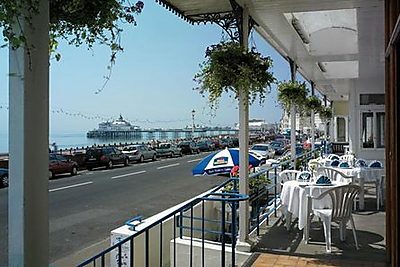 The BEST WESTERN York House Hotel enjoys a relaxed, laid-back seafront location in Eastbourne, just 20 yards from the sea and a few hundred yards from the pier. You'll also be a pleasant stroll away from the town centre, so you can enjoy everything this delightful resort has to offer! With the South Coast literally on your doorstep, there's lots to see and do around Eastbourne. Go fishing from the pier, take walks along Beachy Head , explore the Sussex Downs or simply stroll along the stunning 4 mile promenade right outside the hotel! Sadly dogs are not allowed in the Restaurant. Our comfy rooms ensure you’ll sleep tight at the seaside! We're passionate about the food we serve, and we think you'll love it just as much! Our restaurant boasts fantastic, freshly prepared food. Our chef takes his pick from of local ingredients, so you can pick and choose from a delicious menu! This smaller restaurant serves up a more intimate dining experience, so come in and take a seat! A modern and well-appointed bar, the Verandah was completely refurbished in 2008 and has stunning sea views that make time in here very well spent indeed! The indoor Bermudiana swimming pool is heated to a refreshing 80 degrees, changing facilities adjoin the pool area. £10.00* per night per animal.